Book Pace will help you to manage books that you are reading or should be reading, push you to finish that dusty book on your nightstand or bookshelf and read even more! 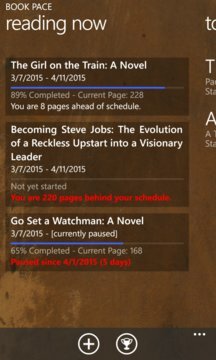 With Book Pace you set a goal date to finish a book and will be able to see how much you should be reading daily and how far ahead or behind that goal you stand. 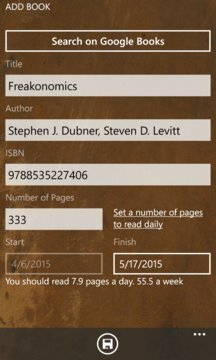 You will get a reminder when a new book should be started and will see precious information directly on app tile. You will compete against people around the world to see who reads more, with a online leaderboard. Are you a real bookworm? So keep the Book Pace!